The South and East China seas are large, offshore basins, formed near junctures between several plates (e.g., Eurasian, Indo-Australian, Pacific, and Philippine Sea plates). The tectonic histories of these basins are complex, with multiple episodes of extension, beginning in the late Cretaceous to Paleogene, that led to sea-floor spreading in the late Oligocene to early Miocene, and for the East China Sea, culminated in Miocene inversion associated with subduction off the Manila Trench. The complex evolution of these basins has been captured by distinct sedimentary sequences that hold a record of the competing influence of tectonics and climate on landscape evolution and sedimentation. On-going efforts with colleagues at China University of Geoscience (Xianghua Yang and Jiaren Ye) are focused on exploring the Eocene to Miocene evolution and source-to-sink history of Pearl River Mouth basin, in the South China Sea, and East China Shelf basin, in the East China Sea, through detrital zircon U-Pb geochronology (e.g., Wang et al., in press). The data are being used to resolve the provenance of the sediment, which provides clues to intrabasinal (local lithology and structural geology) and versus extrabasinal (large-scale tectonics, climate, drainage evolution of the South China and Yangtze tectonic blocks) controls on sediment transport routes and dispersal systems. Figure 1. Topographic map of East Asia, showing major tectonic elements and river systems mentioned in the text. ECSSB, East China Sea Shelf Basin; TXB, Taixi Basin, TXNB, Taixinan Basin. XH, Xihu Sag. The background topographic map is modified from General Bathymetric Chart of The Oceans (Gebco) World Ocean Bathymetry. 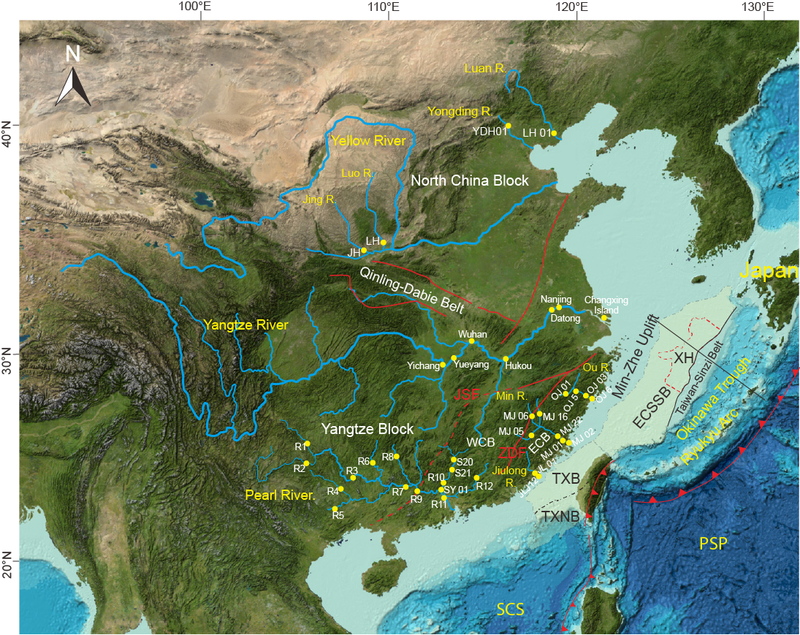 Major faults marked are from Wang et al. . JSF (Jiangshan-Shaoxing Fault); ZDF (Zhenghe-Dapu Fault); The Qinling-Dabie Orogen is the boundary between the North China Block (NCB) and the South China Block (SCB). The JSF is the boundary between the Yangtze Block (YB) and Cathaysia Block (CB). The ZDF divides the Cathaysia Block into west (WCB) and east (ECB) parts. Yellow circle show the location of published detrital zircon samples of modern sediment. Figure 2. (above) Cumulative probability plot for zircon U-Pb ages of river sands from the Cathaysia Block in mainland China and from Paleogene formations in the Zhu 2 depression in the southern Pearl River Mouth Basin, South China Sea. Figure 3. (right) Example cathodoluminance images of dated zircons from the Wencheng, Enping, and Zhuhai formations showing laser spot (32µm diameter) locations and number, and reported U-Pb ages (Ma).